'super-no-res' adhesive labels at Affordable Alternatives, Inc. This very special adhesive was developed to meet the demands for an adhesive that would stay on polyester book covers (even the spines) full-term (a year or more), yet remove easily & cleanly with just a fingernail or plastic peeler (PLS-1). It has many uses in a modern library. NEW label roll(s) (n5) 7/8"x1/2" ylw/red 'super-no-res' adh. vert.Discontinued! These white & blue 'super-no-res' adhesive labels stay on full-term, yet remove easily & cleanly with just a plastic peeler (PLS-1). They are so easy to remove, there is no excuse for date labels on shelved items, & best looking date due label available. You will enjoy 25% more labels per roll, so you load less often. There are 1250 labels per roll,4 rolls, (5000 labels) per sleeve. Inker IR-SPB2 is not included. Date Due snrS210WG 'super-no-res' adhesive white/green labels for Sato mo 210-230 labelers. These white & green 'super-no-res' adhesive labels stay on full-term, yet remove easily & cleanly with just a plastic peeler (PLS-1). They are so easy to remove, there is no excuse for date labels on shelved items, & best looking date due label available. You will enjoy 25% more labels per roll, so you load less often. There are 1250 labels per roll,4 rolls, (5000 labels) per sleeve. Inker IR-SPB2 is not included. Date Due snrS210YG 'super-no-res' adhesive Ylw/Grn labels for IMS/Sato Mo 210-230 labelers. These yellow & green 'super-no-res' adhesive labels stay on full term, yet remove easily & cleanly with just a plastic peeler (PLS-1). It is so easy to remove there is no excuse for date labels on shelved items, & best looking date due label available. You will enjoy 25% more labels per roll, so you load less often. There are 1250 labels per roll,4 rolls, (5000 labels) per sleeve. Inker IR-SPB2 is not included. NEW label roll(s) (n23) fl pink & navy snr 2212 Discontinued Item. Date Due fl pink/nvy snr2212 label rolls is no longer available! This product is no longer available. Please select another color of our 'super-no-res' adhesive labels for use in your Total Library Labelers. This image was made with the XLPro26E ten number labeler. super-no-res' adhesive stays on polyester full-term, yet removes from all library surfaces cleanly & easily with a plastic peeler (PLS-1) or fingernail. Price/sleeve of 8 rolls of 1/2" x 1" 1250 count labels = 10,000 w/1 inker. 20 sleeves per case of labels. Please specify ink rollers for your labeler. Price per sleeve of 8 rolls/10M labels. Imprint date with XLPro26E, (or EA) or Contact 25-8 (or 9). If you own Contact MO 25-8 or 25-9 labeler(s), this may be the New label for you. The 'super-no-res' adhesive white/Blue label stays on polyester full-term, yet removes easily & cleanly with just a plastic peeler (PLS-1) or fingernail. This label is fine for spines. It may be imprinted, applied, & affixed with your choice of XLPro 26E, (or EA), or Contact MO25-8 (or 9), or XL25-10. These 1/2" tall x 1" wide labels have 1200 labels per roll. Date Due for Primark P14 hand-held labeler white & red 'super-no-res' adhesive label rolls. Please order in multiples of 16 rolls. 16 rollls/sleeve. Date Due snrS210WR white/red Label rolls 4 pk. You may use in Sato 210-230 or P167 labelers. This 'super-no-res' adhesive stays on polyester library book covers full-term, yet removes cleanly & easily with just a plastic peeler (PLS-1). Four rolls of 1250 label;s = 5000 (5M) labels/sleeve. 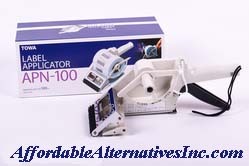 Ink roller (IR-SPB2) is sold separately. Priced by the 4 roll (5,000 label) sleeve. 1000 'super-no-res' adhesive vertical labels for thin books and/or media. Usually ships in 48 hours. Use these labels for temporary 7 Day Loan Labeling for thin items & imprint with the arrival month using a Total Library Labeler (XLPro22-D(L)), or by hand. Samples on the left indicate arrival in October (10), June (06), & the bottom sample is the label before imprint. At the end of the temporary term the 'super-no-res' adhesive permits removal easily & cleanly with a plastic peeler (PLS-1). 1200 per roll. Date Due snr2516WB white & blue Label rolls. Price per roll, for qtys. of 21M+, please order in multiples of 21 M.
Date Due snr2516YG yellow & green case of 160,000 labels..
You may imprint with XLPro25EE (or EEA or EEAA) or Contact 25-88 (or-99) two line labelers. This 'super-no-res' adhesive removes easily & cleanly from any library asset surface with a plastic peeler (PLS-1). Bright yellow & green DATE DUE labels are easily spotted for a compelling signal to return items promptly. Prices are per case of 20 sleeves of 8 rolls of 1000 labels & one ink roller each for a total of 160,000 labels & 20 ink rollers/case. Priced by the case Min. order 1 case. Please allow 30 working days lead time. 14 day label with 'super-no-res' adhseive.